In this course, Prof. N.J. Wildberger gives 26 video lectures on Algebraic Topology. This is a beginner's course in Algebraic Topology given by Assoc. Prof. N J Wildberger of the School of Mathematics and Statistics, UNSW. It features a visual approach to the subject that stresses the importance of familiarity with specific examples. It also introduces 'rational curvature', a simple but important innovation. NJ Wildberger is also the developer of Rational Trigonometry: a new and better way of learning and using trigonometry. 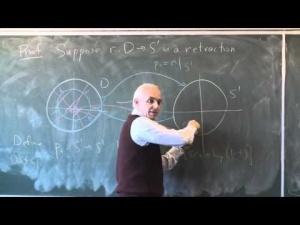 Prof. N.J. Wildberger in Lecture 14: More Applications of Winding Numbers. Peter Marshall wrote 6 years ago. majid wrote 7 years ago. jorge coronel wrote 7 years ago. This is a good work!! yoel wrote 7 years ago. Mark wrote 7 years ago. Bravo! Good job. Thanks for making this public.